John Farrell was born in Braidwood in 1869, son of Thomas and Ellen Farrell. Farrell died on 6 October 1939, aged 76, and was buried in the Catholic section of Botany cemetery. 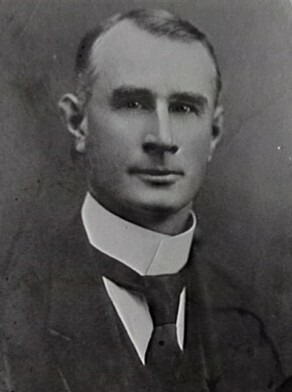 His nephews John Whelan and Thomas Whelan were members of Paddington Council in the 1930s. Braidwood-born John Farrell was a drover, and later a carpenter and builder, who went on to study architecture and became a property owner. In 1919 John Farrell JP was living at Birrell Street, Bondi. In 1912 he was President of the Municipal Labor Assembly and secretary of the Darlinghurst branch of the Political Labor League (PLL). John Farrell was elected Alderman for Bligh Ward, 1 December 1915 to 30 November 1921 and for Phillip Ward, 3 December 1934 to 6 October 1939. He was a member of the Works Committee, 1916-21 and its Vice-Chairman in 1917. He sat on the Electric Lighting Committee, 1916-17 and 1920-21 and the Finance Committee, 1918-19. He was a member of the Labor Party.